Curtis Mayfield‘s border-transcending Superfly is much more than a soundtrack to a cutting-edge blaxploitation film. Recorded in 1972 to coincide with Gordon Parks, Jr’s movie about a dealer attempting to divorce himself from the urban underworld, Mayfield’s brilliantly orchestrated set ignited an entire genre, expanded the scope of R&B, and spurred dialogues surrounding significant social issues ranging from the unvarnished consequences of hustling to the realities of African-American lives in America. Rightly deemed by Rolling Stone “Marvin Gaye’s What’s Going On at a street level” and named the 69th Greatest Album of All Time by the magazine, Superflyendures as an astonishing master stroke of boundary-crossing soul, lyrical smarts, and vital commentary. Mobile Fidelity’s reissue brings it – and its of-the-moment contents – to life like never before. 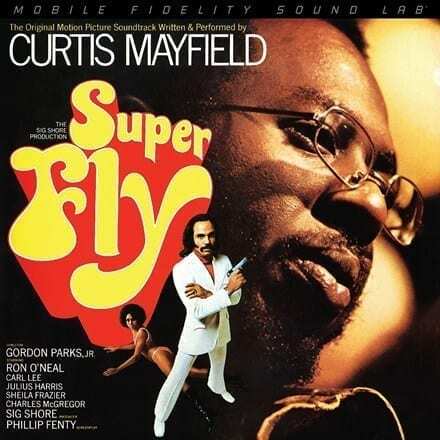 Mastered on Mobile Fidelity’s world-renowned mastering system, cut at 45RPM for the first time, pressed at RTI, and strictly limited to 4,000 numbered copies, this 180g 45RPM 2LP set of Superfly presents Mayfield’s vision with widescreen sonics worthy of its cinematic reach. The extra groove space afforded by the 45RPM edition changes everything and explodes the wealth of aural information. Separation between the seemingly countless instruments, the myriad timbres of Mayfield’s voice, the ambitious breadth and crucial shifts of the strings, the probing reach of the lean albeit direction-leading bass: You’ve never heard Superfly sound so vibrant, realistic, or immediate. Surpassing the status of an album, the 1972 effort comes across here as an audiophile-vetted cultural signpost – an epic on the order of Duke Ellington’s Black, Brown & Beige, Miles Davis’ A Tribute to Jack Johnson, and Gaye’s aforementioned manifesto.